wondered what everyone keeps on the OUTSIDE, because that is really a window into people's lives. But do people still put stuff on their refrigerator doors, or are everyone's fridge's non-stick? Our is about nine years old, bought just before almost every appliance in the universe went stainless, so I have a magnet collection. Most are from England, and my favorite is a seasonal series from the London Transport Museum. Unfortunately, they discontinued them before I got Autumn, so if you ever run across it, you know who would like it... And then there is the Cheshire Cat, which I found at Half Price Books a few weeks ago and couldn't resist. I do miss Kid Art, and would love to see if Susan's is decorated with The Kiddo's drawings. Technology moves on, however, and my daughter tells me that there is a company that makes magnets from your Instagram photos. More tasteful than crayon scrawls and postcards, but as much fun?? What about you, REDS? Do you have kitchen galleries? - Baby pictures. Love the baby pictures. 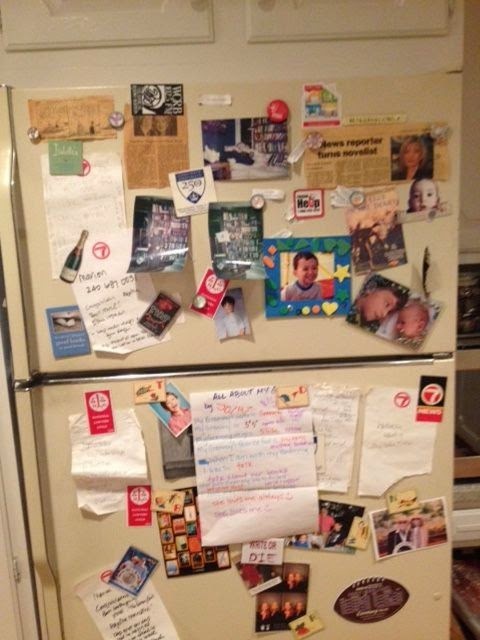 DEBS: Hallie, love your fridge! Love the cartoon, and oh, baby pictures. Where else can you look at them a dozen times a day? And I love that no one's collection could possibly be the same. My "Never Walk Alone" is a gift from my niece. The Le Creuset is from my friend Gigi. "A Christmas Story" I bought when Marcia Talley and I visited the Christmas Story House when we were in Cleveland after Bouchercon. (metal) front door, which is Fridge Art 2.0.
call. A fortune. Grandchildren, Nancy Drew, a blue jay feather, my cat Lola. I should take it all down. I can't. a TV show on how to avoid Alzheimer's. And Meghan's fashion drawings, and an old Christmas pic. When the kids were young we had magnetic letters and used to write each other messages every day. But alas, my other fridge, in Arizona, is stainless steel. Nothing sticks to it so it is pristine. How about you, dear readers? Individualistic art and memorabilia gallery? Or a stainless clean slate? 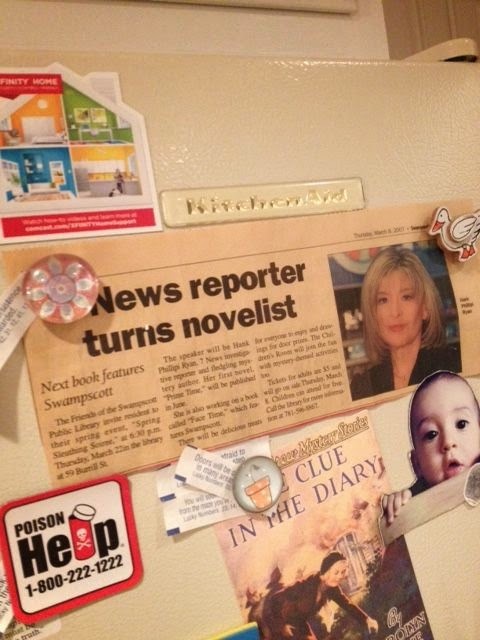 You can find almost anything on my refrigerator: magnets . . . clips . . . a whiteboard calendar . . . grandbaby art . . . measuring spoons . . . recipes . . . a measurement conversion chart . . . I could pull it all off, but I kind of like it, all helter-skelter and mish-mashed together. And I can actually find that recipe I wanted to try . . . .
After my "clean/dirty" magnet wouldn't stick on the dishwasher (how can you tell???? ), I refused to have anything to do with a stainless fridge (I happen to hate stainless. My house came with a stainless sink long before the recent trend-- I'm hoping the trend will pass, since I prefer white enamel or seamless Corian). So I have lots of stuff on the front of the fridge, including a magnetic dishtowel rack with a towel on it and a chart of how many calories you burn doing various things like vacuuming and shoveling snow. And photos of dogs gone but not forgotten. BTW, Hallie, re the cartoon, there is only one way to understand British detectives (and some of the staff at Downton Abbey): CLOSED CAPTIONS. Not just for the hearing impaired, but also for the accent impaired. I, too, greatly dislike stainless steel appliances. For one thing...they're not. Stainless, that is. Very cold and clinical, too. 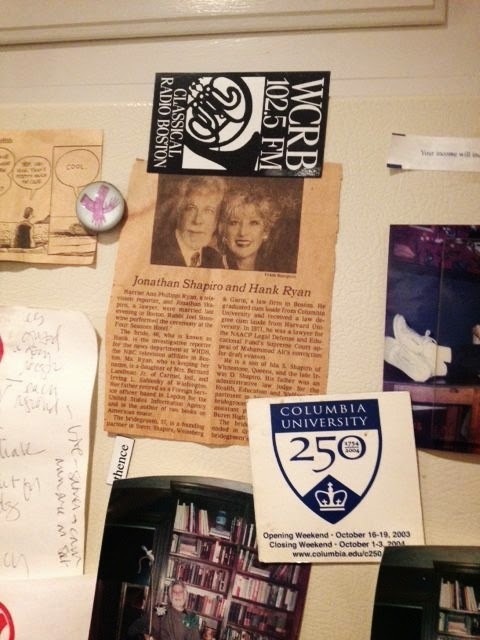 The side of my lovely white fridge holds the measurement chart that Joan mentioned, magnets from places my grandkids visited, a magnetic soda can opener, good sayings: "Attitude of Gratitude"--just stuff that needs to be handy. When my son made me a HUGE bulletin board, down came the family and friends photos from the fridge front. It's now a photo gallery ONLY of pets we've loved and lost. Dogs, cats, even a bunny our English friends had for too short a time. I'm very much in the Hank and Rhys camp. My favorite magnet? 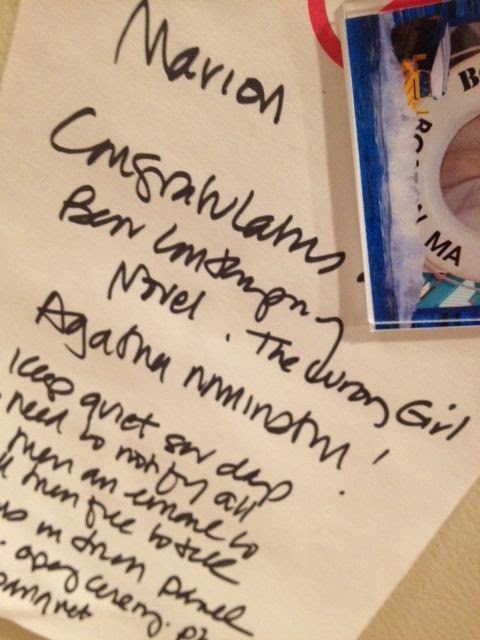 The one in blood-dripping letters that says WRITE OR DIE. These are wonderful, thanks for thinking of this Debs! 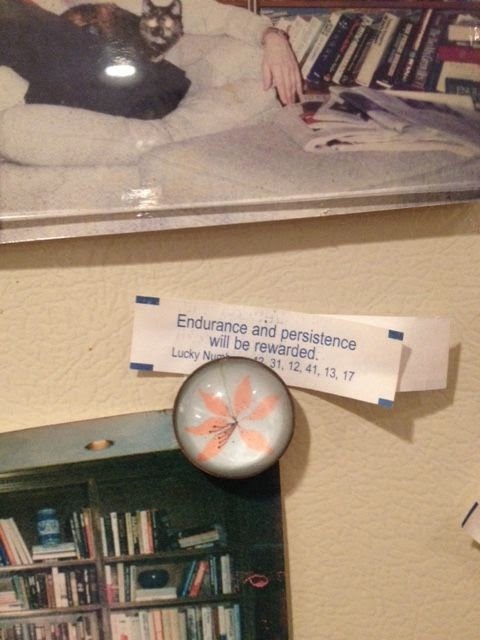 Of course we would find that fortune--endurance and persistence will be rewarded--on Hank's fridge. 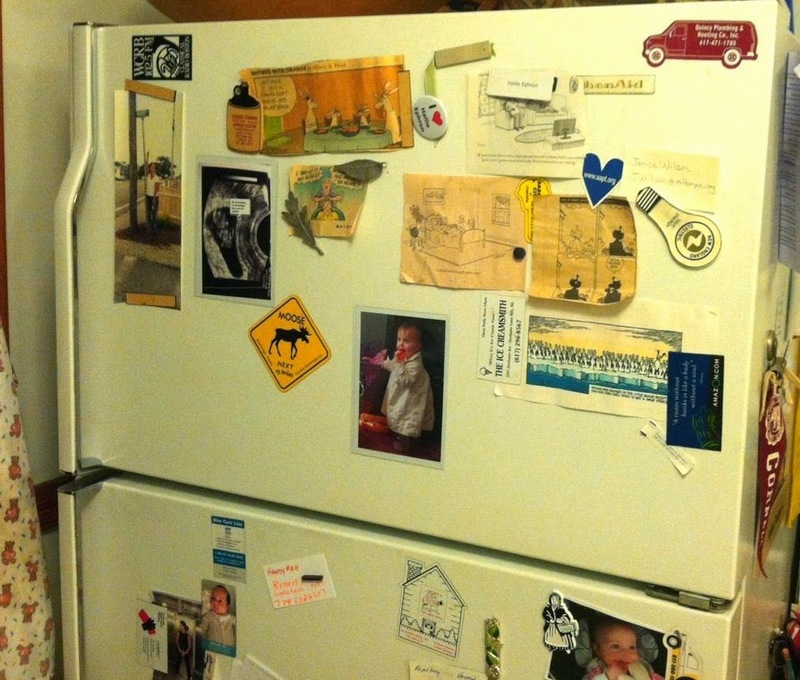 Funny that growing up I can't remember anything EVER magnetted to the fridge. Maybe magnets hadn't been invented yet? Love This! Every blog, it is revealed, yet again, how much we have in common. Everything down and start over, so embarrassed was I when I saw the photo. But now… I'm going to leave it. Oh, how I love refrigerator art! We had to buy a new fridge unexpectedly last year. (don't we all hate unexpected appliance purchases??). I couldn't wait to put "stuff" back on it. A lot of magnets, of course, and a few political statement stickers, of course. Photos and notes, invitations and recipes. And by the way, sorry to have been missing this week although I've been reading every day Debs and enjoying your posts. I've gone though a crashed hard drive and all the horror that entails (story worthy!). Edith, I want that magnet! Mine is, well, covered. An assortment of magnets, from clip types, ones given to me, those from army family conferences, to those from soccer teams of yester-year and more recent swimming pics. A write-on/wipe-off calendar with changeable months. Lists of basketball practice and church meetings. School lists. A few cartoons. An old school lunch calendar and the boy's most recent school progress report (he's good). We used to have kiddo art, but the kids got bigger. But they decorate the write-on/wipe-off calendar. I've heard the sides of some stainless fridges are still "sticky." Kaye, we've missed you, too! Yes, hope you tell us about the hard drive--everyone's worst nightmare! I'm delighted to have a coloring book picture up from my five-year-old granddaughter and my recent magnets from Key West. I have a favorite space window magnet from the National Cathedral in D.C., a magnet from the Salvador Dali Museum in Tampa (museum has been moved now), several magnets from Hawaii, a Chesapeake Bay Bridge magnet, Niagara Falls magnet, and a Virginia Festival of the Book magnet. There are more, but those are a good representation. I have a postcard from a friend who spent last Christmas in Rome and a postcard from when my husband was in either Quatar or Afghanistan (it's a camel). Hallie, I love that you have comic strips on your refrigerator. A tip for preserving them is to buy the laminate sheets and cut it to fit the cartoons. My two comic strips are one from Shoe and one from B.C., and, of course, they both have to do with literature. I will describe the comics and their content below. Shoe is a comic strip using birds as its characters. The strip I have displayed includes the main character Shoe, a cigar-smoking grouch of a newspaper editor, and his somewhat inept reporter named Perfesser Cosmo Fishhawk. Shoe: Back from the pen already? Fishhawk: I couldn't wait to get out of there...This prison beat gives me the willies. Shoe: How was your interview with the Falcon? Fishhawk: It went okay...I actually thought about teasing him, to, you know, break the ice...But then I had second thoughts. Fishhawk: It's not a good idea to mock a killing bird. Hahaha! The second comic stip, B.C., involves a cave woman pointing out to the cave man how women are great at writing poetry in view of the poem by Joyce Kilmer about trees. The cave man is thinking to himself how much he is going to enjoy telling her that Kilmer is a man. Debs, thanks for such a fun topic today. 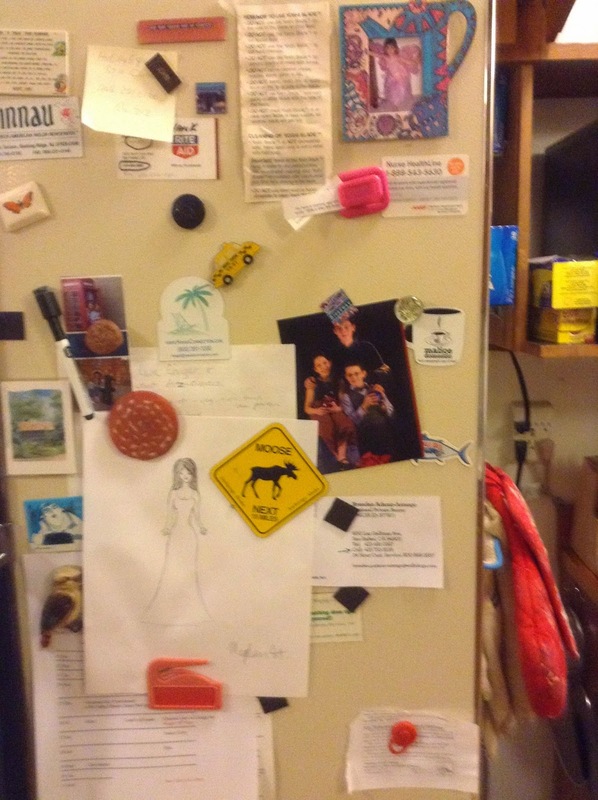 I agree that Hank should be crowned Fridge Art Queen! I liked the way it looked so much, I kept it clean! Now my fridge sports maybe three of those magnet business cards for local services we use. It's weird because I am SUCH a clutterer otherwise. Ross said to me recently when I was debating how much furniture to remove from our living room with the advent of the new, larger sofa, "Jule, you're not a minimalist. For you, more is always more." Oh and about the massive amount of stainless appliances that have become de rigeur this past decade? I predict they will look as dated as our mothers' Avocado Green and Harvest Gold kitchens within a few more years. Live by the trend, die by the trend. Thanks for that input, Julia. That's what I'm hoping will happen with the ugly stainless appliances. I much prefer white, although most of them cost more, for some unknown reason. And like Ellen, I prefer the seamless Corian sinks. We have one we put in more than 16 years ago and it still looks great, unlike the stainless bar sink I rarely use. It looks awful with our local hard water. On my fridge: I used to have a big calendar that showed every family member's activities, but we no longer need to keep track of so much stuff, thank goodness. Now I have a monthly calendar on the side, along with a hook with my phone charger, and the aforesaid measurement conversion chart. Which I so rarely use, and could probably throw in a drawer. On the front is a sweet note from my husband, and all of our upcoming invitations, plus two pair of gift tickets to next months's sports, boat & travel show (friends are the organizers). All my magnets have meaning: the red flower from the Cincinnati Art Museum, the ceramic magnolia from the Magnolia Plantation in Charleston (where daughter #3 went to college), and a cute, vintage-looking one that says "She had not yet decided whether to use her power for good or evil". Also, a giraffe, which reminds us of our trip the Serengeti last year. 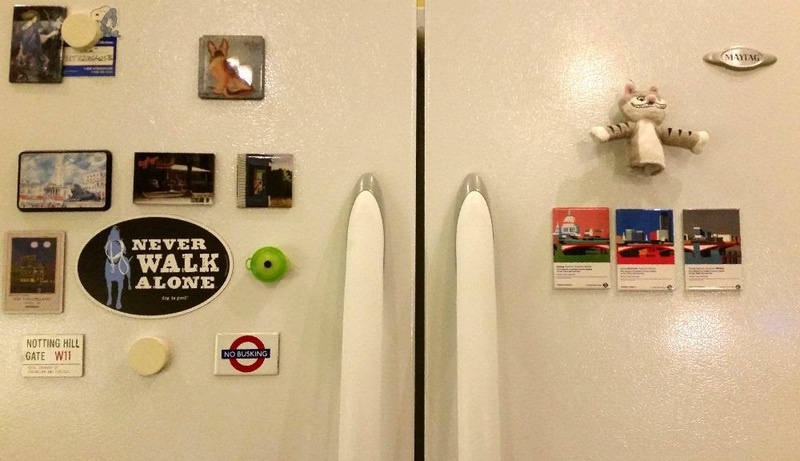 I used to stick things on with interesting magnets but now our fridge is stainless steel. I tape cartoons on that I like. A lot feature female preying mantises for some reason and Scotsmen. Grandsons, grandsons, grandsons. And other friends and family members too. The idiot who designed the non-magnetic fridge should be stuffed into his own freezer and buried with an ice stake through his heart. All our appliances except the fridge are stainless, and I like them. But our cabinets and counter tops are off white, so white doesn't quite go and is a little boring, too. If we were ever to move (which will never happen) and have a larger kitchen, I would like white cabinets and red appliances. When we bought our new stainless refrigerator I had to take a large shoe box full of magnets off - states we had visited, pictures, notes. . . what I really miss is the calendar. Now I can't tell the family "it's written down, go look." I have a desk calendar but it is very mobile so I am back to being their reminder system. Magnets will stick to the side of the fridge but you have to be selective and things aren't as visible so it's not the same thing. I had planned to be very crafty and use something (cookie sheets, paint, metal???) to display all those magnets again in the kitchen. I am currently using the excuse that I plan to remodel soon but it's a project that will probably never happen. And I kind of like less clutter. For my home office I took a cookie sheet and hung it up backwards and rotate what's on it. Currently there is Pocket Jamie, tiny SF Lombard St. calendar, a picture of us having a night out in Chicago in 1970, some smart-alecky magnets and a little swag from authors. Mentioned this topic to one of my daughters, who reminded me of a grade school teacher who collected magnets. He taught fifth grade, and kids could get a couple points added to a grade for bringing him a magnet he didn't already have. There was a large white steel cupboard in his classroom, and the thing was covered in magnets, which he removed every year to make room for the ones the kids gave him throughout the year. I wonder what he did with all those! When I had to get a new fridge about 15 months gao I had to take down all the magnets and the items they secured to the old fridge. There were baby pictures of people who are now college grads! There has always been art from one niece or nephew or another. I have slowly begun covering the new refrigerator with magnets, artwork, postcards about Hank's books, about upcoming exhibits at a museum, reminders to take my car in for an oil change, to make dental appointments, etc. The old one was so totally covered that I sometimes didn't remember what color it was! Oh, and years ago when I accidentally knocked a magnet off the fridge and it skittered underneath the appliance, I got out a yardstick to sweep underneath and retrieve it. Out came a hand-painted refrigerator magnet I had never seen before! It apparently belonged to the people I bought the place from! 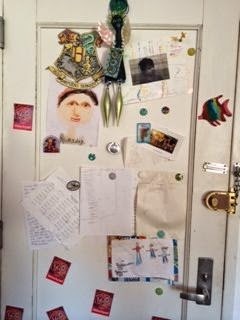 Susan, I too have a metal front door which has been covered with magnets, notes, artwork, over the years! 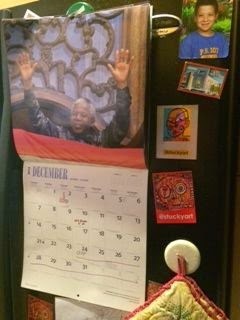 I'd feel right at home with Hank's refrigerator. When I moved, I kept the fridge fairly cleared off for a while, but have gradually added treasured bits. I just found some packed-away photos and decided the back door can accept a bit more memorabilia . . . Happy solstice, Hanukkah, and almost-Christmas, all, and happy anything else you'd like to celebrate. We need the joy!